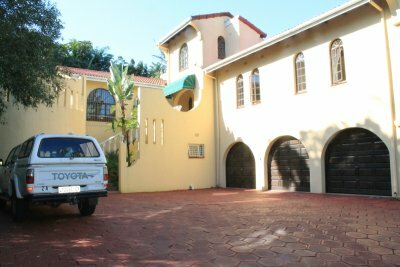 Footprints Inn B&B, situated in the North coast in Empangeni invites you to experience home away from home. Set in a lush garden surrounding; enjoy a peaceful break away from the hustle and bustle of the city. Linda and Richard invite you to experience authentic and original Zululand hospitality. Footprints Inn boasts six luxurious ensuite rooms with air conditioners, TV, DSTV, tea and coffee facilities. Choose from a single room to double or even family rooms at an affordable price. We have a central fully equipped kitchen and dining area for self catering or enjoy one of our scrumptious meals on request. Sit at the bar and enjoy a drink or use braai facilities, whilst enjoying the tranquil tropical garden and abundant bird life. Some of the many attractions are the Umfolozi/Hluhluwe game reserve situated about 100km away, beaches 35km away, Shakaland 50km away, golf courses, Tusk casino 4km away, CBD 2km away, Richards bay harbour 30 km away, Boardwalk mall 30 km away. Let our friendly staff pamper you. Footprints Inn was voted best B&B in Feb 2013. Voted for friendly service, beautiful and clean premises. We are ten years old this May 2013 and wish to thank all those that voted for us in the North Coast. We strive to make it a better place for you and live up to our expectations as being the Best B&B in the North Coast.